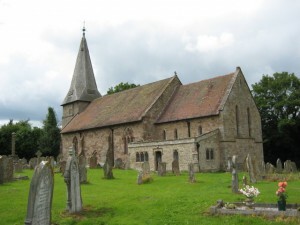 The charming church of St. George is right in the village itself, rather than some distance away as is typical for many Herefordshire churches. Inside the vestry are two dug-out chests dating from the 13th century, and a tablet bears testament to the fact that in 1956 Mr. Rodney Proctor of Cincinnati, whose great grandfather and great great grandfather were vicars during the 18th century, restored the church totally. In 1867 the chancel of Orleton Church was re-opened after rebuilding and restoration, so that the whole church was complete, and was said to be a good example of what a village church should be – simple, substantial and handsome. The nave was completed two years earlier, being re-opened for service in February 1865.